You can never have enough pedals in your studio. 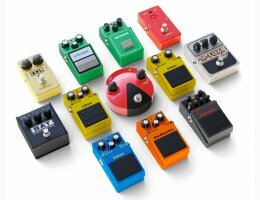 There are thousands of stomp boxes on the market of different sound, purpose and quality. Audified chose 12 legendary pedals to revive the legacy of the famous DSound Stomp Boxes and Audiffex Pedals and created MultiDrive Pedal Pro – the perfect combination of distortion, overdrive, fuzz & boost is the right blend for your studio developed by professionals. MultiDrive Pedal Pro was originated for guitarist to kick up their sound. The team of Audified engineers created the perfect simulation of the legendary pedals which every musician should have in the studio. Boost for hearing every detail. The improved Pro version offers even better sound and features than the legendary original version which is used by thousands of musicians and studios. With 32 killer presets chosen by guitarist, the Pro gives you many options to kick up your sound! 808-Scream is based on Ibanez TS-808 Tube Screamer. B-Drive is based on Boss Blues Driver. The BD-2 Blues Driver delivers the creamy, yet crunchy sound associated with great blues guitar. O-Drive is based on Boss Over Drive. The OD-1 is by now legendary. Artist of the 70’s was mostly using a fuzz distortion sound and the overdrive produced by the OD-1 was not typical. S-Drive is based on Boss Super OverDrive. The SD-1 has been around for a very long time and has gone almost unchanged from its conception back in 1981. The pedal contains an asymmetric overdrive circuit that responds very well to the player’s picking force. One-Distortion is based on Boss Distortion. The DS-1 Distortion is a true icon in the world of guitar effects. Introduced in 1978, BOSS’s first distortion pedal defined a bold new sound, delivering hard-edged attack and smooth sustain that’s been a staple of players for generations. BAT-Distortion is based on ProCo RAT Distortion. The Pro Co "The RAT" is a guitar effects pedal produced by Pro Co Sound. XXL-Distortion is based on MXR Distortion+ which is a distortion pedal originally designed in the 1970s by MXR Innovations. M-Distortion is based on Boss Metal Zone. It delivers a very wide range of distortion sounds with 3-band EQ and strong sustain. F-Fuzz is based on Jim Dunlop Fuzz Face. The Fuzz Face is an effects pedal used mainly by electric guitarists and by some bass players. It is a stompbox designed to produce a distorted sound from an electric guitar, a sound referred to as "fuzz,". M-Fuzz is based on Electro-Harmonix Big Muff Pi. The Big Muff Pi, often known simply as the Big Muff, is a fuzzbox produced in New York City by the Electro-Harmonix company, along with their Russian sister company Sovtek, primarily for use with the electric guitar. T-Booster is based on Brian May Treble Booster which is an effects unit used by guitarists to boost volume and especially the high end of their tonal spectrum, and was popular mostly during the 1960s.808-Scream is based on Ibanez TS-808 Tube Screamer. Note: An iLok key or account is required! You may authorize to the key or to your computer at your choice. You may download a 30 day trial demo version from this link.